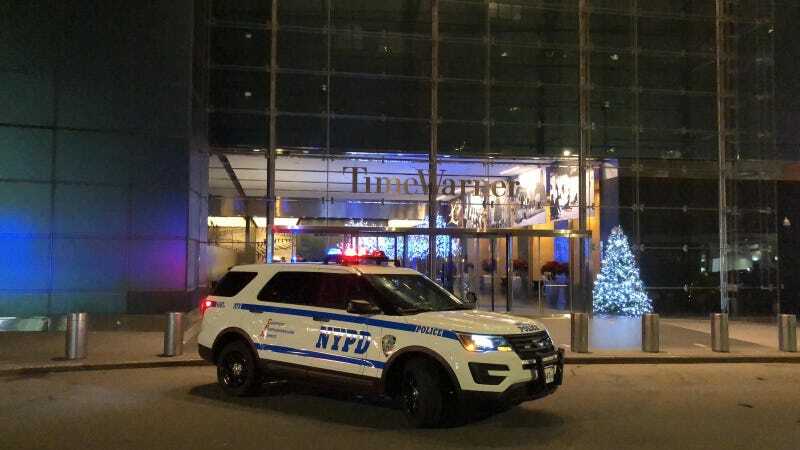 Employees at CNN returned to their offices and studios late this evening, after being forced to evacuate the Time Warner Center in the wake of a bomb threat called into the building. For a short while, the network was forced to switch to pre-taped material after workers and on-air talent were asked to leave the building in the middle of CNN Tonight , while the NYPD searched and a bomb squad was kept on stand-by. Per CNN itself, employees were eventually given the all-clear to return to work, despite an anonymous caller allegedly phoning in earlier in the evening to say that five “devices” had been planted somewhere in the building housing the company’s offices and studios. In other news, the President of the United States—a frequent critic of the cable news network, who has steadily escalated his hostility toward the media in the nearly two years since he took office, despite the fact that at least 1 of the 35 mass shootings that have taken place in America during that same period was specifically aimed at the murder of journalists—tweeted out the following sentiment to millions of followers tonight, just a few minutes before the threat was allegedly called in.